Have you wanted to try Avon's Anew Skin Care Line but didn't want to invest your money in something you were unsure about? 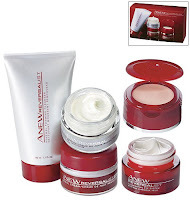 Well now is the time to try out the Anew Skin Care Line ~ You can purchase a 4 pc Starter Kit. STEP 1 – Cleanse with the Age Repair Cream Cleanser Try-It Size. Hydrates for hours with no greasy residue. Luxurious, creamy cleanser gently yet effectively removes impurities, as it helps condition skin. Formulated with Pro-Sirtuin TX Technology, it continually hydrates for hours without leaving a greasy residue. Skin feels radiantly clean and richly moisturized. Suitable for sensitive skin. Dermatologist-tested. Allergy-tested. 1.7 fl. oz. STEP 2 – Moisturize with the Day Cream SPF 25 Try-It Size in the morning, and Night Cream Try-It Size in the evening. Each, .5 fl. oz. STEP 3 – Treat with the Contouring Eye System. Unlock the power to reshape, repair & recontour your eyes. .59 total fl. oz. Concentrated Elixir provides 2X the level of an intensive densifying ingredient to help reduce the look of undereye bags and fat pockets. Use PM, under eye only, over Intensive Repair Cream. .09 oz. net wt. Intensive Repair Cream is formulated to restore elasticity as it reduces and firms. Use AM & PM, over entire eye area. .5 fl. oz. STEP 1 – Cleanse with the Foaming Cleanser Try-It Size. Moisture rich & fast-foaming—removes dirt & excess oil. Cleanses gently without stripping skin of vital moisture. 1.7 fl. oz. STEP 3 – Treat with the Illuminating Eye System. Brightens even your darkest undereye area. Two-part eye system with Activinol Eye Technology. Helps reactivate skin’s repair processes and dramatically reverse visible wrinkles. Sheer veil with potent skin brighteners. Illuminates undereye area instantly. Use after eye cream and reapply as needed. .09 oz. net wt. Eye cream: visibly repairs dark, circles, fine lines and wrinkles over time. Use twice a day all over eye area. .5 fl. oz. STEP 1 – Cleanse with the 2-in-1 Gel Cleanser Try-It Size. Innovative 2-in-1 gel formula deep-cleans and tones, as it rejuvenates fatigued-looking skin. Formulated with a fusion of pioneering technologies -- Exfo-Smoothing Complex, MiniExtraction Technology and RevitaFresh Technology – inspired by a professional anti-aging facial. Instantly, leaves skin looking and feeling clean, toned, and refreshed. With continued use, improves skin texture and makes pores look tighter. Visibly reduces lines and other signs of aging to reveal fresh, younger-looking skin. Oil-free. Dermatologist-tested. Allergy-tested. 1.7 fl. oz. STEP 3 – Treat with the 24 Hour Eye Moisturizer with SPF 25. Use AM and PM on eyelids and undereye areas. Day Eye Cream Broad Spectrum SPF 25 UVA/UVB scientifically designed to reduce undereye circles and protect against UVA/UVB damage to sensitive lid & undereye areas. Night Eye Cream specially formulated to visibly reduce undereye puffiness and smooth the appearance of fine lines & wrinkles. .33 total fl. oz. Just let me know if I can help you with any of these products. Right now my SPECIAL is Free Shipping & Free Lip Gloss with your $30 direct delivery order! I love the way you post this article. This is wonderful post. I do hope you intend to post more of these types of information. Thank you for this interesting information!